Today I was privileged to visit the Downtown Mission and collect my food hamper. Its contents were not same as the sample list that I published on this blog last week. There was no potato and no onion. There was no peanut butter. The contents included: 2 cans of tuna and one can of chicken, 1 can of kippers, 1 package of Kraft Dinner (sorry, no name mac and cheese), 3 individual size cans of beans, 4 cans of soup, one can of mushrooms, half a dozen tea bags, a can of pasta sauce, half a pack of spaghetti, a package of noodles (you know – that stuff looks like block if squiggly worms) , a small sleeve of crackers, a bag of cherries, one juice box, a pack of sidekicks rice, a can of zoodles (sorry Sponge Bob Square Pants noodles really), and one loaf of white bread. On the way home I had half the pack of crackers and the juice box. What? I was hungry! I have just finished my dinner – tonight’s delight? When I was a kid I loved caned Zoodles etc…so I had the Sponge Bob Square Pants Noodles with some bread. I was still hungry, so I also at the noodles in the hot water. I missed making a plate of food with three or four lumps. Do you know what I mean? When we have dinner, I am used to preparing at least a meat, a starch (potato, rice, or pasta) and a nice vegetable or two. So I am feeling satisfied at the moment, but I have the feeling that I will be hungry in an hour. There seems to be little to no nutritional value in the foods that I received today. This will be a big challenge this week as I am becoming quickly aware of how much I take for granted the nutritional value of the food I am fortunate to enjoy every day. Being that the mission today was a helpful experience. I received a book with recipes that help stretch the food received from the food bank. We also heard from people who have had to use food banks who shared their experiences. It was pointed out that while there was some excitement and energy about our trip to the food bank today, most people who have to make their first trip to the food bank do not share that experience. I went into the food bank today hoping to see people I knew and was delighted when I saw my friend and colleague The Ven. Kim Van Allen who is Archdeacon of Essex. In reality, if I was in need of the food bank, I would have been hoping against all hope not to see anyone I knew as I made my way to the food bank. (I am impressed that Kim actually walked to the Downtown Mission as many others would have to do). This means that I need to leave my comfort zone to identify with others. I encourage all of you to think of how you may leave your comfort zone. While I engage on this challenge I encourage you to ask yourself, how you and I might find ways to preach good news to the poor, how we might proclaim freedom to the prisoners, release to the oppressed and to show by our lives that God’s favour has been set free for all people. Stay tuned to the blog as I will keep you posted as to how this week is going. God has been good to bring this opportunity to our community and I pray that we may find ways to reach out and express our faith by identifying with those who are on the margins of society. Another group that eats this way are students. Yes indeed….When Catherinanne was Chaplain at the U of Windsor she started the first food-bank on campus…we became very aware at the tiem of how very great the need was and remains so today…if not even worse. I believe that what you are doing is wonderful. You have alreay identifed one of the issues with the food bank that needs our help and that is finding a way to improve the nutritional value of the meals prepared from the food provided. 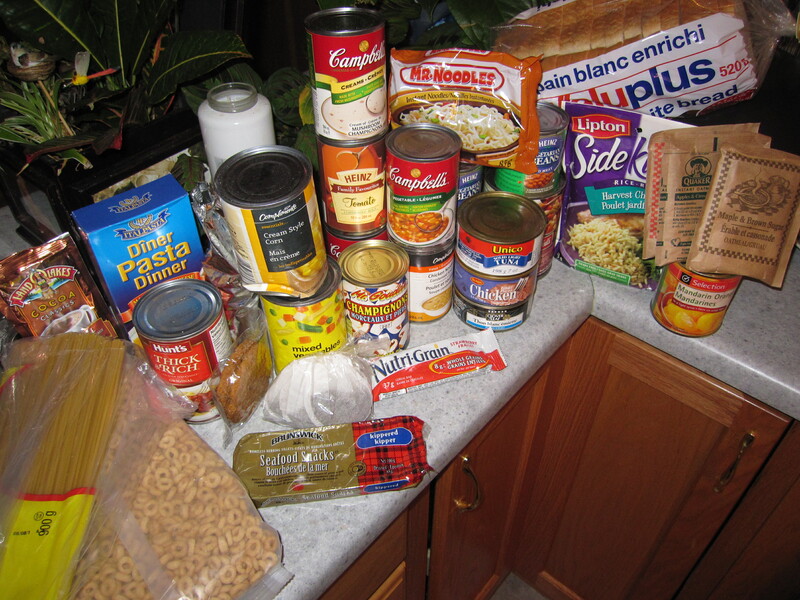 I do not have the solution but am thinking we need the input of a dietition to identify basic lower cost items to include and then some brainstorming to find a way to colect the items so the food bank can supply them to people in need. You are right that we need to continue to monitor what we provide to the food-bank…but the most obvious thing that needs to happen is an immediate food supplement to Ontario Works. $585 a month does not cut it. One of the goals of the ‘Do the Math Challenge’ is to encourage people to call on their elected officials to add a $100 per month food supplement to help people be able to go the the grocery stores and buy produce etc. Beyond the food-banks there is a dignity issue here that needs to be addressed. As I had my fresh raspberries on oatmeal this morning (two half pints for $5 at Remark last week) I realized how unhealthy it is to live on the type of menu possible at a food bank. There are no fresh vegetables or fruits. Thank you for making me more aware of the daily struggles of people on public assistance through your participation in Pathways to Potential. I LOVE Raspberries….my absolute favorite berry. One of the big challenges today is the thirst…everything is so salty. Even though there is not a lot of food in the foodbank bag, there is certainly a lot of sodium in the food. I know you are not expecting to lose any weight on this diet and the salt would be a big factor. Bon courage. Drink the water before eating to quell your hunger. Dream of raspberries and maybe one of your friends will bring you some of your favourite fruits. I am going to remember to buy nice bottled fruits for the foodbank since fresh things might have a distribution problem. Thanks, Kevin, for your observations of the quality of food in the food baskets. When When I purchase things for the food bank, I try to select the most healthy and filling items I can find. It is a challenge. St. Mark’s parishoners have been very generous in providing food for those not as privileged as we are. This past summer, fresh tomatoes and beans were taken to Drouillard Place and Street Help, that were grown in our Church garden. Our Thanksgiving decorations of squash, onions and potatoes were delivered to St. Johns’ food bank and Drouillard Place. Perhaps we can plan for next year, to grow other vegetables that we could then deliver to the food banks. Good Luck with the rest of the week!! My name is Donna Marentette and I am also doing the challenge. I live in Leamington so went to the Salvation Army and Ministerial Food Bank there. Unlike the folks who went to the Downtown Mission I received a lot of food. I was actually overwhelmed with the amount of food I received. I realized that the food was a given to me as a gift. Whereas the people of Ontario collectively through the government withhold food by not giving people in need enough money to buy food yet the local churches and other community groups, businesses and individuals give it. The people at the food bank were very proud of what they can give to the people who are in need.